When the Yahoo logo was unveiled, Marissa Mayer keenly highlighted her input claiming that she loved "brands, logos, color, design, and, most of all, Adobe Illustrator" – she went on to say that she "rolled up [her] sleeves and dove into the trenches with [her] logo design team." A huge media storm ensued Marissa Mayer's decision to help Yahoo's Graphic Designers create the new Yahoo logo and it has now emerged that the CEO has turned her hand to helping out other departments as well. 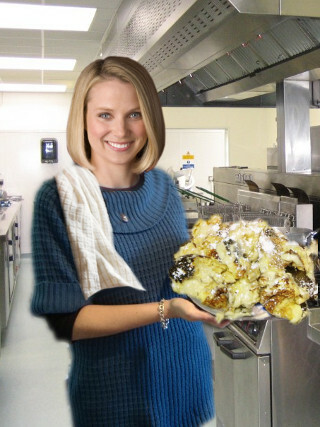 "I love eating, food, flavors, tasting, and, most of all, baking cakes" Marissa Mayer announced. "I've therefore decided to roll up my sleeves and dive into the trenches with the catering department"
It's transpired that since making this decision, Mayer has taken charge of desserts, directing the chefs, ordering the ingredients and personally coming up with all the recipes they cook for the staff at Yahoo HQ. "Marissa certainly knows the principles of good design," One employee admitted "She's made sure that everything follows the golden ratio, but I'm not sure that adding a 1:1.6 flour to salt mixture was the best application of that rule." "While purple watery custard might not be everyone's idea of dessert heaven, it's not a total failure." Chuck Hankman, a major Yahoo shareholder informed us, "And at least it keeps her out of the graphic design office leaving the trained professional designers in charge."